Next on my list was a cook set in my continued search to lighten my back backing load and not spending a fortune. I have this two pot set where the lid was a frying pan. It was heavy but I could fit the gas canister and MSR Pocket Rocket inside with ease. However it was an unwieldy size and weight. I was looking at the titanium sets that were available and weighing up my options *groan*. There were the usual suspects; MSR Titan Kettle, Tibetan Titanium series, Vargo Tri-lite. In the end it came down to some economics and price. I had narrowed it down to a choice of three; Alpkit's MytiMug, GSi Outdoor's Halulite Minimalist and the Tibetan Titanium 450 mug. All were priced around the £25 mark. After a bit of Eeny, meeny, miny, moe, catch the baby by the toe. If it screams let her go, eeny, meeny, miny, moe, you are it. I went for the Halulite Minimalist. Why? I just felt I was getting more for my money. The Tibetan is just the mug, the MytiMug comes with a lid but the Halulite Minimalist comes with a lid, an insulating pot sleeve, a foon (their version of a foldable spork) and a silicon pot gripper. It's made from Halulite a proprietary alloy that is hard anodised. The blurb on the website claims; it's as light as titanium, resistant to scratches, abrasions and burn circles. The alloy is uncoated therefore eliminating the need to use special utensils to protect the pot. All this to help keep the weight down and the thermal efficiency up. I can't say it boils any quicker or slower than any other pot. I haven't set up any tests to time the boil. It doesn't leave me hanging about for a brew and there are no; as of now, scratches from my titanium spork. It's build quality is very good. On my scales it weighs 99 grams naked. That's without the sleeve, lid and pot gripper. With them it's 173 grams. 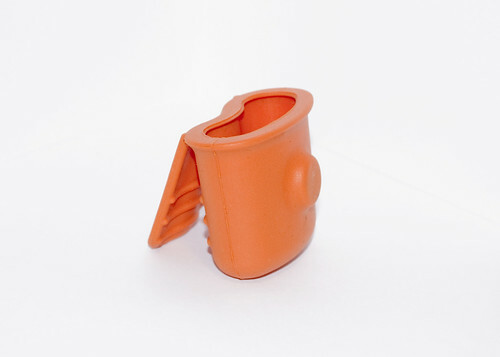 It's a neat little package with diameter of 100mm and a height of 105mm by my ruler and holding over 600 millilitres. Big enough to hold a Coleman 100 or similar sized self sealing gas canister and even a small canister top stove like the Optimus Crux for carrying in one convenient package. Unfortunately not my Pocket Rocket. I'm glad that I fired up the stove and tried the pot out before going on an actual trip with it. I found a couple of issues. One being the silicon gripper. I found that if I filled the pot full of water and then tried to lift the pot off the stove with the gripper, my two fingers were in the boiling water. Although they were inside the silicon you could still feel the scolding heat from the water. Also I felt that it wasn't secure having to lift 600ml, 600g of water plus the weight of the pot between your thumb, index and middle finger. I don't have the finger strength of a climber and I don't want to have to go and do some Kung Fu 5 finger death punch exercises in order to lift it. I resorted to using my buff as I have done frequently in the past with other vessels but I could have used the pliers on my Leatherman or a set of pot grips. The 0.6cl is plenty of water for a good big cuppa tea and this is the crux if you're like me and aren't that keen on dehydrated meals. This is your one pot for cooking and drinking from. Do yo take the weight penalty and carry a cup for drinking your beverage out of? I'm tying to shave the weight off not add more. As of the last few times I've used it, I've just cleaned it out. Not very efficient. I reckon that if I could get a taste for dehydrated meals I would have more than enough water for a meal and a drink in one boiling. No need for repeated cleaning then. My other issue was with the folding foon. I broke it, at it's folding joint but this could just be me. I can be a bit heavy handed when it comes to utensils. I have managed to break or melt three of the 'indestructable' plastic sporks made by Light my Fire. I now have a titanium one and it seems to handle the abuse that I dish out, at the moment. It was light and would do the job shovelling your grub but I didn't get that far with it. The lid and neoprene sleeve are great. 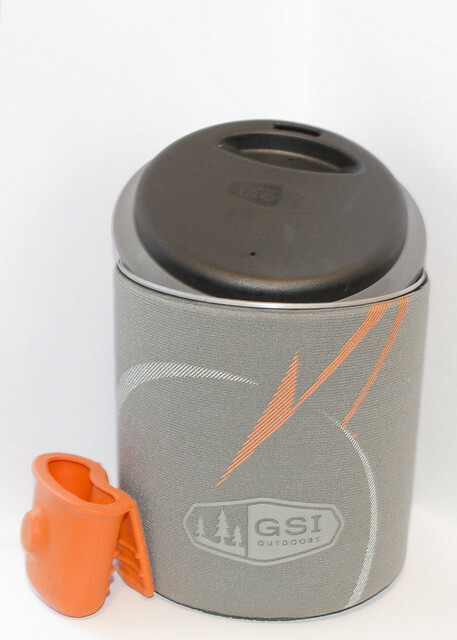 The insulating sleeve does what it says, allowing you to hold the pot with out the fear of burning yourself or get dirty and it's great for keeping your brew warmer longer. Especially on the cold mornings around camp. The lid is a very smart design as well; flip it one way and it is a standard lid helping to get the water boiling quicker, flip it the other way and it becomes one of those Starbucks like sip it lids. I know in the one hand this won't be the pot for everyone. I on the other hand really like it. It works for me with how I'm walking and camping. I'm happy with it.